He's so happy now, and looking for a forever home. You can't blame Hank for flinching when a hand reaches out to stroke his head. He's not used to kind hands. More like the hurting kind. 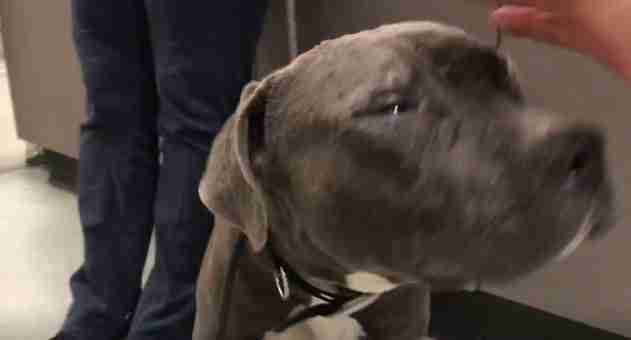 In October, when he was just around 10 months old, his former owner was spotted at the side of a southern California road beating the dog severely - before leaving him to die. But in the age of social media, even a dog without a voice can make a cry for help that's carried far and wide. Someone saw the attack and shared pictures on Facebook. Fern White, a longtime volunteer at the Animal Hope and Wellness Foundation, was tagged in those pictures. "They kept tagging me," White tells The Dodo. "'Fern White, can you help?'" Well, of course she could. Like she's done so many times before, alongside Marc Ching, the celebrated animal rights advocate who cofounded the rescue. "As soon as I was tagged and saw this, I called Marc and said, 'We've got to get this dog,'" White says. 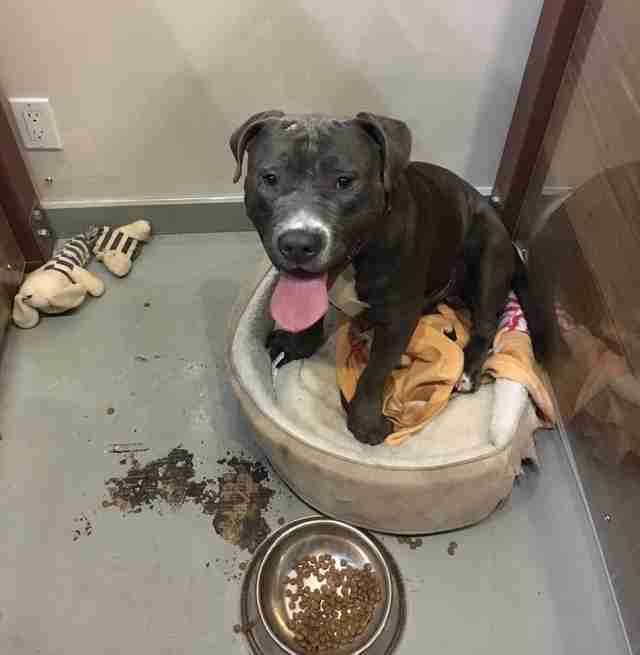 The only problem is the dog, who was taken by animal control officers to the East Valley shelter in Los Angeles, had become untouchable. 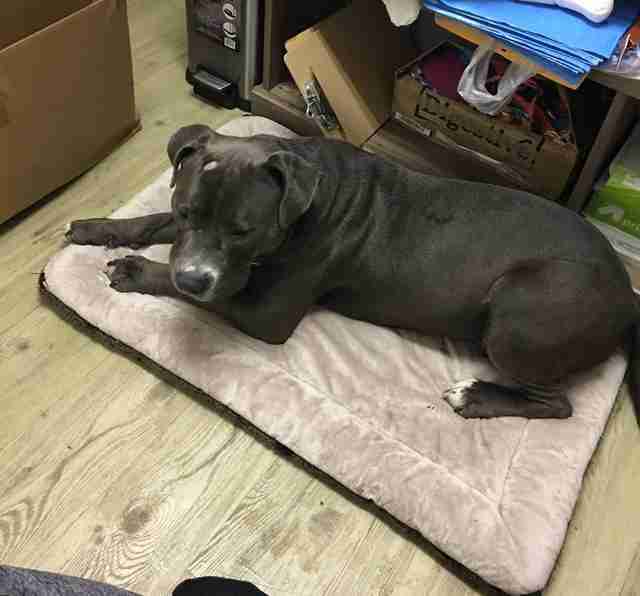 A police investigation had been launched into his Hank's owner. He was more than a victim now. He was evidence. "It was sad because, once the medical stuff was done, he was basically just sitting in a cold dog shelter," White says. "He could be at our place getting love." So Hank went from cruel hands to no hands at all. For another month, Hank was unrescuable. .And then, earlier this month Ching got a call from the East Valley shelter. Hank was no longer evidence, but rather a dog again. A dog who needed a lifeline. Ching, who happened to have just rescued a chicken from a local slaughterhouse, rushed to the shelter. And Hank scampered into his car. But the world of rescue can often take a turn for the strange and surreal. While driving with the chicken and the pit bull, Ching came across a very intoxicated man kicking a Chihuahua on the street. "Of course, he stops and pulls over," White recalls. Hank got out of the car too. Ching demanded that the man surrender the Chihuahua. And the man, rather than face animal abuse charges, complied. "And then, he turned the next corner and there's a Doberman running through the streets," White continues, with a laugh. There was still room in the car that would eventually make its way back to the rescue's headquarters in Sherman Oaks, California. "So he comes back with a chicken, a Doberman, a Chihuahua and Hank in his car," White says. And so a pit bull who was once considered evidence became living, breathing proof that kind hands can make a world of difference. Think you might like to adopt Hank - or the Doberman or the Chihuahua or the chicken or any other animal who could use a forever home? Check out the adoption page for the Animal Hope and Wellness Foundation. And if you would like to support the organization and its mission to save countless animals, consider making a donation.